Destra is a contemporary font family which is the latest offer by the Brazilian designer Isac Rodrigues and his isaco type foundry. A real typomaniac, Isac has recently released two very successful fonts – Basel Neue and Cantiga. Now is the turn of the next one in line – the condensed humanist Destra. Destra font family itself is distinctively narrow serif designed especially to perform best at small sizes and to save space. In fact, “destra” is the Portuguese word for right hand, and we consider it a perfect name for this workhorse typeface as it is very reliable and trustworthy and will never let its users down. Its elegant and fashionable look is a result of mixing of typographic styles. Destra is designed in such a manner as to minimize and almost eliminate accidental errors when using it. The font sports great legibility and will be suitable for many applications especially when a great amount of information has to be contained in smaller and narrower spaces. 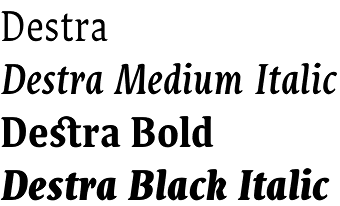 Destra font family includes 4 weights – Regular, Medium, Bold and Black all with their true Italics. The users that have access to OpenType savvy software will enjoy a nice set of extra features like standard and discretionary ligatures, titling, stylistic and contextual alternates, fractions, alternative glyphs, superiors and inferiors, old style, lining and tabular numbers as well as a great extra that allow you to convert Arabic to Roman numerals up to 1000. Also, there is a great language support for Central and Western European languages together with Baltic, Turkish and Romanian. 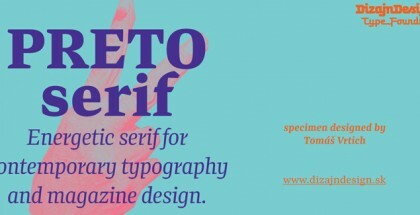 Get Destra font family and enjoy an error-free work!